In our first world comfort zone, we’ve mostly forgotten what it feels like to have an empty belly. That kind of hunger is mostly something we’ve found a way to solve. 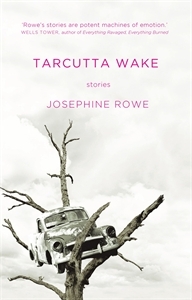 But there are other hungers, and it is these yearnings for a those other kinds of sustenance that Josephine Rowe tackles in Tarcutta Wake. This collection of short stories, snippets and slices pares back the layers of her characters’ lives to describe – with metaphor and indirect gaze – the human ache to be the weft in something’s weave. Tarcutta sits at the mid-point between Australia’s two largest cities, Sydney and Melbourne. It’s in New South Wales, on the Hume Highway and up until relatively recently was the main road route between the two centres. Four hundred and fifty six kilometres from Melbourne and 438 kilometres from Sydney: whether or not you stop there, the secret of its position has the pull of the symmetrically symbolic. (Few ever stopped there, I gather – and even fewer now that it’s been bypassed by a dual carriageway freeway). I could not help making the leap, as I read and re-read this collection, extrapolating out from Tarcutta to ‘mid-point’ and leaping out from there to ‘limbo’. The story that names the collection is at least in part about being past the midway point – it touches on aging and death – so maybe I’m reading too much into nothing, but that’s something Rowe’s stories tend to lead us to. Our species has a kind of inbuilt hunger for stories, and we are good at filling in the gaps, even if we’d rather someone did it for us. On my desk at home I have stack of other peoples’ photos. They are old, faded and sepia. I bought a vintage album and they were in it but because I bought the album for the album, and because I couldn’t bear to discard these pictures of real people, I keep them in a stack tied with ribbon and I reach out to look at them from time to time, between other things. I can see just enough in them to be tantalised by who they might be and what their stories might be, but knowing is impossible; they are completely out of context. A man in a suit with a brick wall and climbing roses behind him holds his trumpet in his left hand, against his midriff. A buxom older lady with a tight bodice glares into the camera. A family of five stare at me from the centre of a dirt road – a strange little group in the middle of nowhere, all dressed up for civilisation and only gumtrees all around. These photos have a similar effect on me to Rowe’s collection. Her pieces are like snapshots, full of intricate detail and deftly drawn characters. Her people are fleshed out in delicate brushstrokes, and we feel we almost know them, but she is all show and no tell. In ‘Into The Arms Of The Parade’ a model takes a break from sitting for a portrait. She is intrigued by the artist’s existence, and wishes she could turn over a postcard she sees on the shelf: ‘I thought that if I could only flip it over and read what was on the back, I might be able to know something about her.’ The model is experiencing something like I experienced when I read the story with her in it. I wanted the back of the postcard. Another story, ‘Heart of Gold’ is narrated by a puzzled observer of some strange and unexplained behaviour. The piece finishes with the line, ‘We tried our best to make sense of it.’ As did I. I turned that page back and forth, reading the story over and over again to try and make sense of it. The piece became more and more beautiful the more I read it – I believe I could recite it now, if prompted. But the meaning I yearned for was out of reach. The paradox of Rowe’s writing is that even as she stops short of rounding out her pieces to something we could recognise as a ‘story’, you do sense that you are in safe hands. She has a gentle, assured touch, a deep understanding of what it means to be searching and lost. But she draws no conclusions. Without a doubt, her portraits of people and circumstance create a clear, true picture, each authentic in its simplicity and complexity, poetic in its language. But they are only portraits. The story is somewhere else. And no, there is nothing unfinished about this collection. The writing is all beautiful – breathtakingly so. But it does have incompleteness about it. These stories will not help you find answers to your questions. They will not provide you with explanations. They will, instead, push you gently to the window and remind you to keep searching for a way to satisfy your own very human need to connect. Miriam Zolin’s writing has recently appeared in PenTales, Griffith Review, Cordite Poetry Review, Australian Book Review and The Sleepers Almanac. This entry was posted in Issue 7, Josephine Rowe, Miriam Zolin, Tarcutta Wake, UQP and tagged Australian Fiction, Australian Literature by Mark Roberts. Bookmark the permalink. Thank you Miriam for this beautiful and fully articulated review. I have enjoyed it immensely. I had a brief response to it which was mainly about the editing and was set in the context of much uncritical gushing and some very shallow reading, so it is an immense relief to find your full review with its appreciation of the beauty of the writing.